Living and gardening by the coast, I find my senses become attuned to a very specific set of sensations: the sound of seagulls, restless wind and tourists dispossessed of their volume control; the smell of seaweed and fish and chips; the feel of salt in my hair and sun on my cheeks. 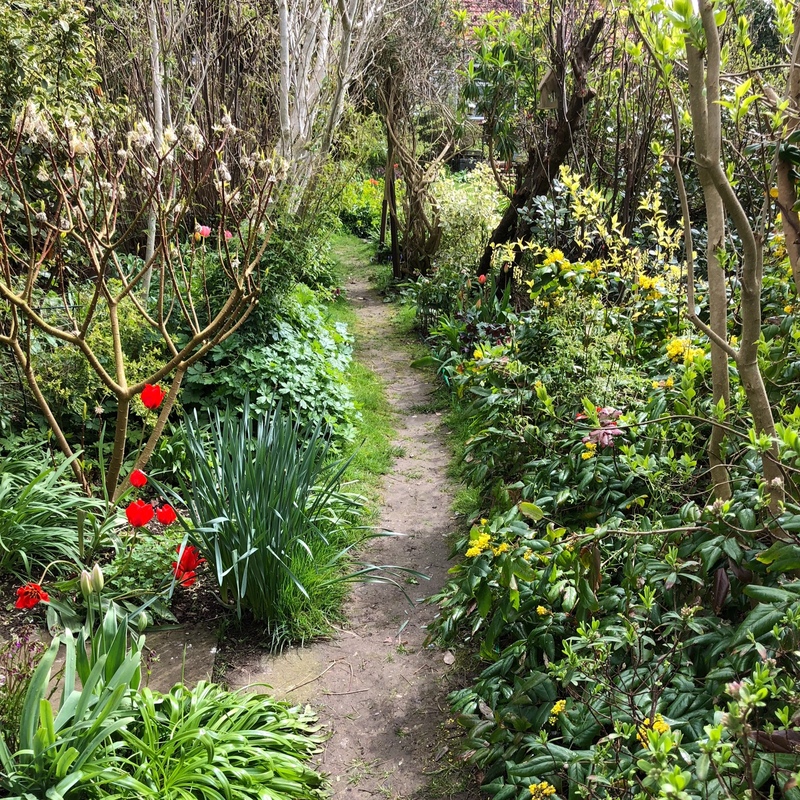 So when I visit a garden in a different locale I am struck, not by the house, plants or owners, but by how it feels, looks, sounds and smells. On Sunday, National Garden Scheme coordinator Andrew Montgomery and I headed out on our first day-trip to preview gardens in East Kent, ahead of their official openings. Our mission is to encourage visitors to come and experience the tremendous talent and generosity of those prepared to open their gardens for charity. After a speedy inspection of my own garden (it passed, just), we set off into the cool, misty morning. 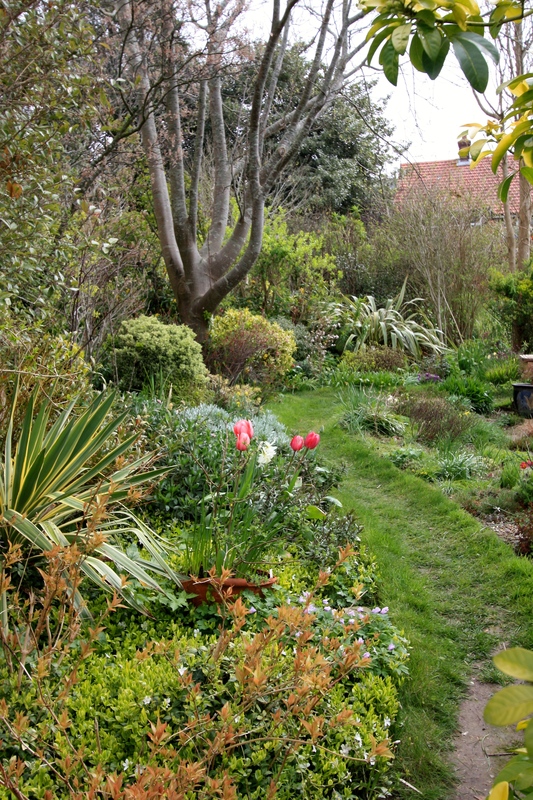 The closely planted front garden at 34 Cross Road, Walmer offers little suggestion as to what lies behind. A low, red-brick bungalow has sat in the plot since the 1930s and is now surrounded by established and unusual plants. The first clue that the garden might be a little bit special is a trough containing dainty Trillium rivale (brook wakerobin) close to the front door. The crinkled, white flowers light up the shade cast by a dense thicket of evergreens. Once through the house, a long, tapering garden is revealed, sloping gently away to a neatly chamfered hedge of Lonicera nitida (box honeysuckle). The small patio is a great vantage point from which to admire a fine view toward the villages of Great Mongeham and Little Mongeham. Owners Peter Jacob and Margaret Wilson are enthusiasts after my own heart. 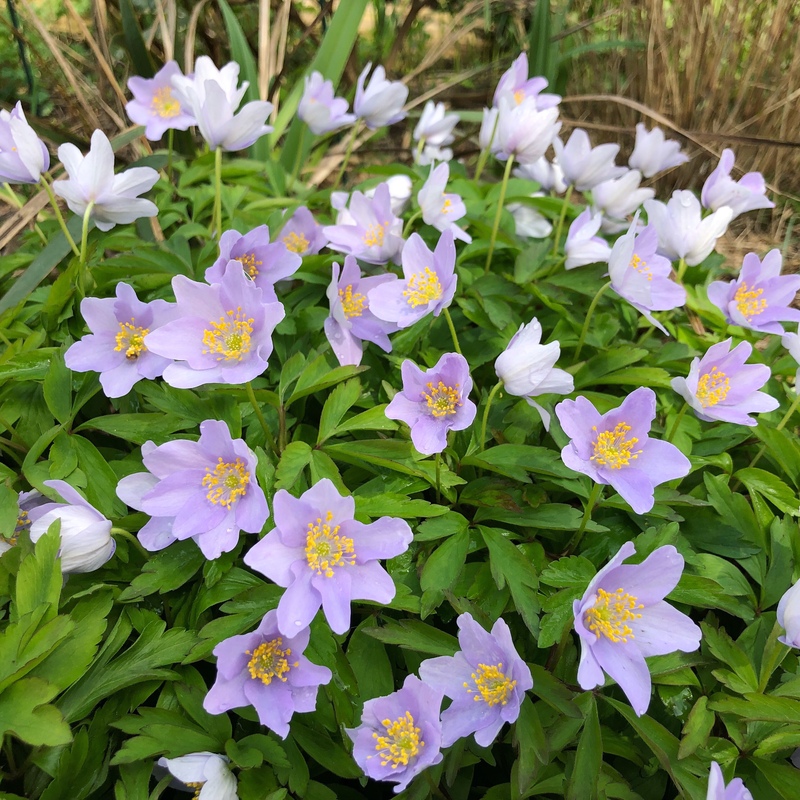 They delight in seeking out new and interesting plants, accruing substantial collections of daphne, hardy geranium, anemone, trillium and fritillaria. In 1965, when Margaret moved into the bungalow, the garden was besieged by brambles and inundated by nettles. Slowly but surely a garden was made, and over time it has evolved into a plantsman’s paradise. Margaret enjoys propagating new plants from seed and is especially proud of two soaring Gingko biloba which stand like sentinels against the skyline. (By now, visible through the mist.) Their tall, columnar profile is typical for young gingko, but enhanced by careful pruning. These trees number alongside many raised by Margaret over the years she’s lived at 34 Cross Road. 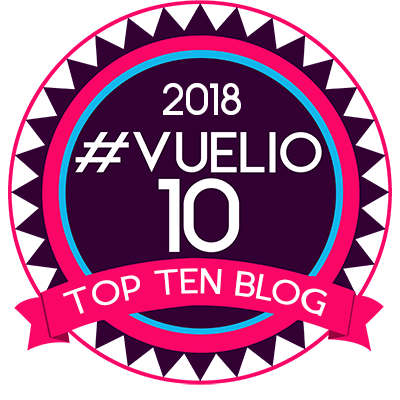 Closer to the ground, Margaret points out a carpet of self-seeded Eryngium ‘Miss Willmott’s Ghost’ and a handsome specimen of Euphorbia rigida growing in the lee of a greenhouse. 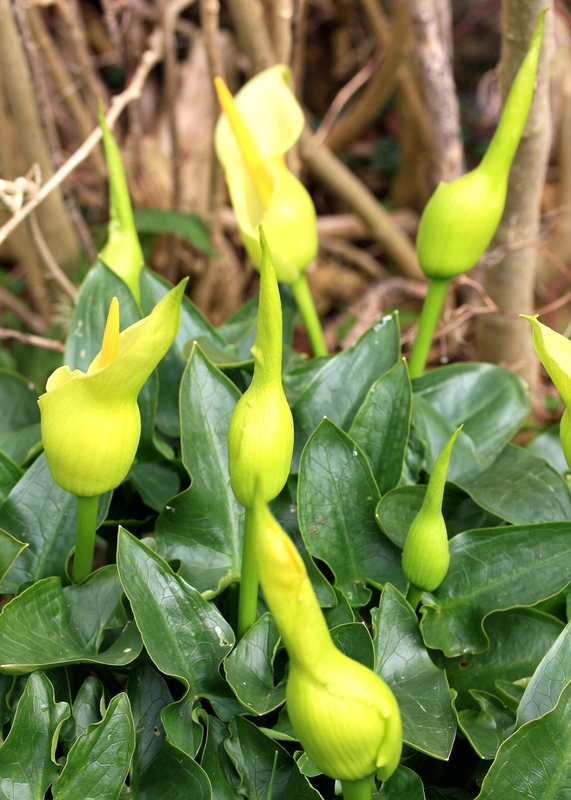 Nearby, another of Margaret’s seed-grown treasures is Arum creticum, a striking aroid producing glossy-green leaves and lemon-yellow spathes in spring. Each way one looks in this garden there is something of interest and every opportunity is taken to squeeze in ‘just one more’. How well I know that inclination! 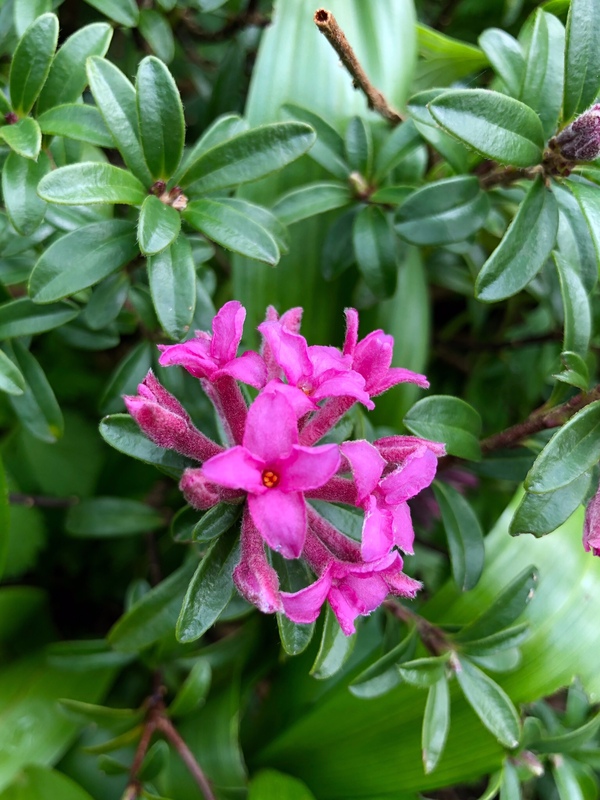 Peter’s passion for the genus Daphne has driven him to collect over eighty species and hybrids, many of which have matured into beautiful specimens. 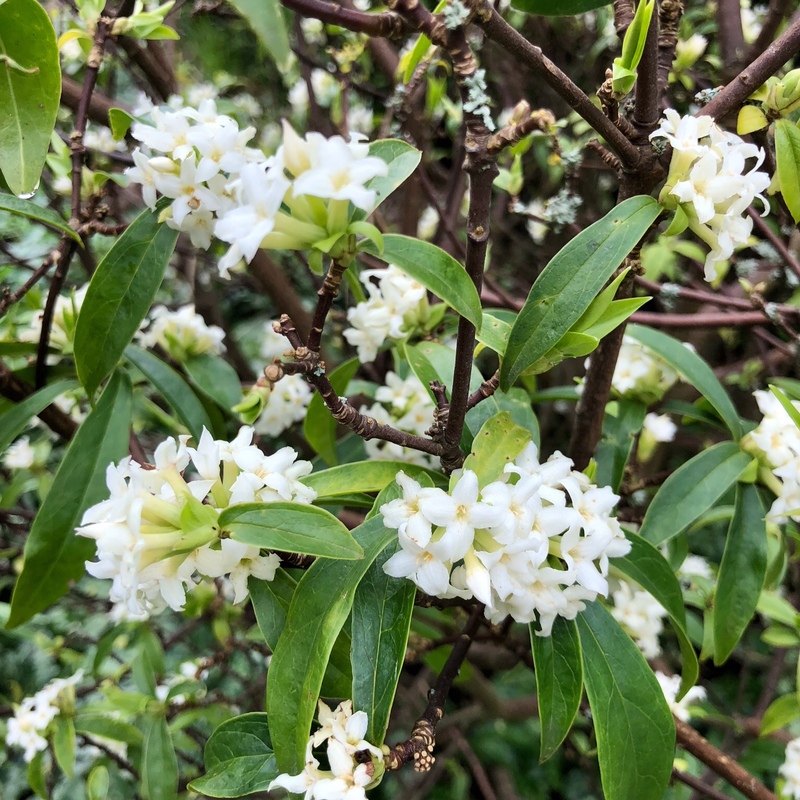 Where the third-of-an-acre garden finally tapers to a point, one brushes past sparkling-white Daphne acutiloba ‘Fragrant Cloud’ filling the air with perfume. Daphnes flourish in this garden despite there being only a foot or so of soil before hitting solid chalk. Years of cultivation has created an enviable tilth. Forming part of a group of daphnes, the peony-pink flowers of D. ‘Serendipity’ also caught my eye. This is a Mediterranean species, occurring naturally from Italy to Greece on stony, limestone slopes. At least twice I stopped to admire a handsomely branched Edgeworthia chrysantha, still producing fabulous scent despite being well past its peak. As we retired for tea the mist cleared from the horizon and the garden was bathed in pale sunlight. This immediately prompted the flowers of Anemone nemorosa ‘Robinsoniana’ to open, revealing petals flushed with a delicious hint of lavender. The sunshine encouraged several clumps of red and white tulips to ‘pop’ in the main perennial border. 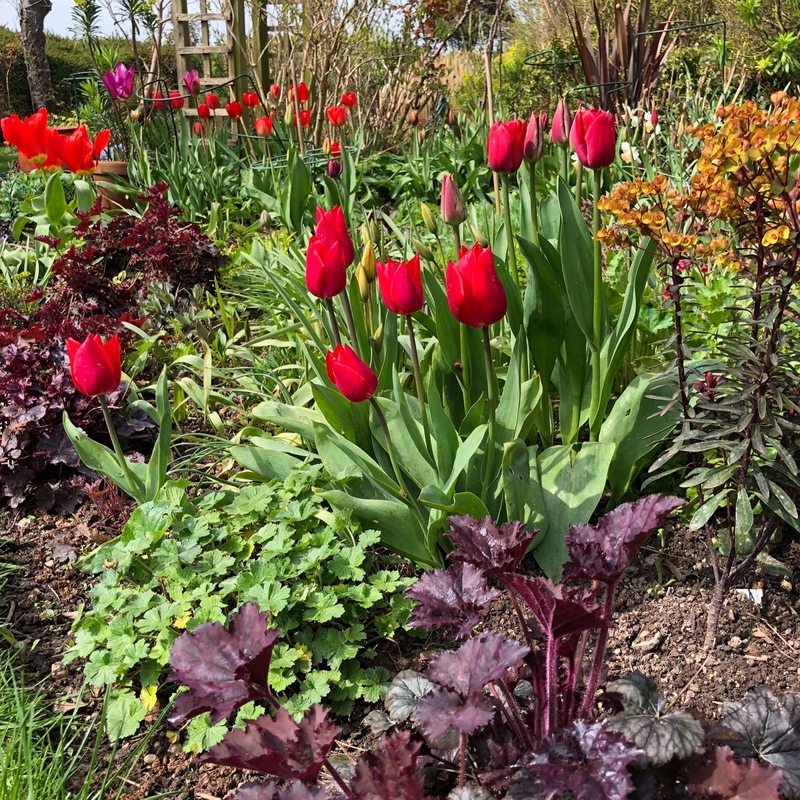 I particularly enjoyed the combination of burgundy-leaved euphorbias and heucheras with blood-red tulips. Just the kind of drama a garden needs to get it kick-started in spring. The layout of Peter and Margaret’s garden is informal and ever-changing, constantly in flux as new plants are added and others rejected. Both gardeners have a keen eye for what makes a strong plant. Like me, they abhor a vacuum, filling every square inch with plants, whilst having several more in reserve. What can I say? Plants are addictive. 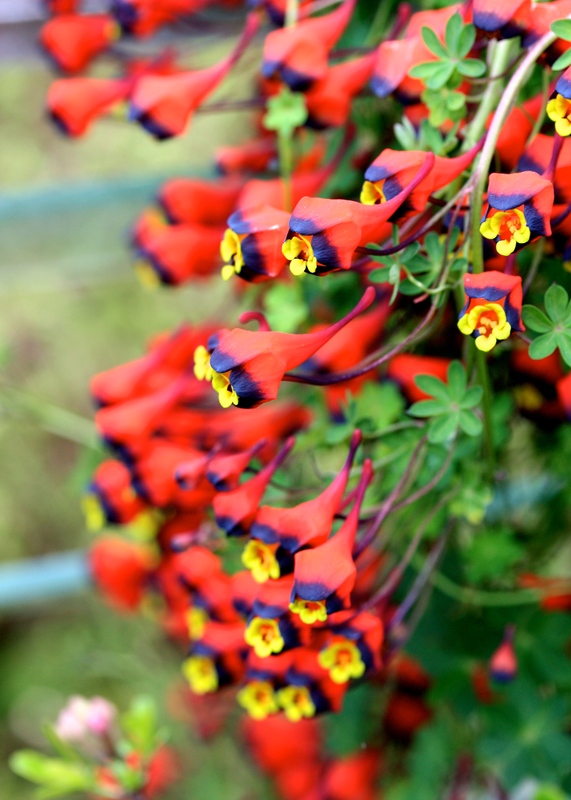 Visit this garden if you are genuinely interested in plants and in taking time to see what you are looking at. And when you’ve done that, close your eyes, breathe deeply, fill your lungs with the scent of daphne blossom and listen to the birds singing. Your senses will be awakened and your knowledge of plants extended threefold. TFG. The garden is large enough to create the right growing conditions for both shade and sun-loving plants. The garden at 34 Cross Road is open from 11am until 5pm this Sunday, April 22nd 2018 and again on Sunday, June 17th at the same times. Entry costs £3.50. No teas, but there are plenty of refreshment opportunities in the nearby towns of Walmer and Deal. 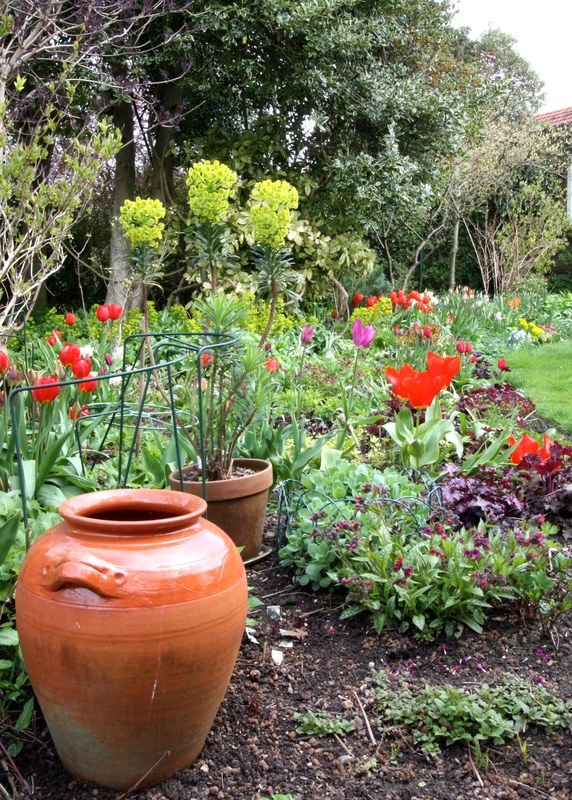 Visit the National Garden Scheme website for details and directions. If you are thinking about opening your own garden for charity, or would like to know more about the National Garden Scheme, do drop me a line at thefrustratedgardener@gmail.com and I will put you in touch with the NGS team. Wonderful! Thank you for sharing the beauty…(especially appreciated having just come out of an ice storm in Ontario, Canada). Absolutely gorgeous….and those tulips and the daphnes…. swoon…..
Gorgeous! This really makes me want to get out in the garden again! What a wonderful garden. So much in 1/3 acre. Just too far to go sadly. Except for the Arum, those plants are so very different to what we have here. Beautiful photos! Hoping to pop along on Sunday. It looks lovely; thanks for the preview. Did you make it Sam? I hope there were some tulips left after all the warm weather. I spent the day potting up gingers, cannas and dahlias. My back is complaining today! I love that second to the last shot though they are all lovely. It speaks of some place yet to be discovered and be explored. I do like a garden where you need to duck under and look over to see everything – makes it more of an experience. I do think one of the benefits of being a gardener is it hones you observation abilities. As leaves and flowers drawn you into their tiny worlds forever changing your perspective. Then as you sit back and take in the whole you see the greater composition. I enjoy gardens that touch all your senses. I love your description of the tourists, the smells and the salt in your hair! I was there if only for a moment! There was such a lot to look at in this garden; almost too much. Wonderful to meet likeminded plant fanatics. Thank you Paul. You too. It’s been superb gardening weather so far. You certainly get some of the weirdest pictures. That anemone is really out there. The nasturtium is something that I wanted to grow, but have not gotten around to it yet. I tried the blue nasturtium, but got nothing. I would recommend this particular nasturtium as it flowers at a time of year when not a lot else is going in – in those colours anyway! Really? I have seen it a few times, considered growing it a few times, but then never follow through. It just looks so weird. I know that if I ever get it, I will perpetuate it forever, whether I actually like it or not. I am told that the blue nasturtium is rather weedy, and I am none too keen on the appearance of it, even if the color is as excellent as it seems to be. I can’t wait for flowers!! The beauty of them is outstanding!